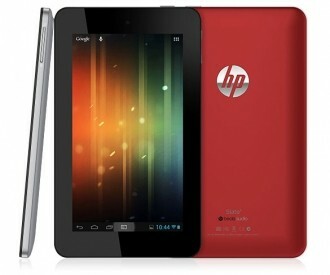 HP re-entered the tablet race over the weekend with the announcement of the Slate 7. The company’s first tablet since the short-lived TouchPad will run Google’s Android operating system and sell for just $169.99. As you might surmise from the name, the Slate 7 will carry a 7-inch display operating at 1,024 x 600. HP specifically points out that the FFS+ LCD should perform well in low light and have great viewing angles. Inside is a dual-core 1.6GHz ARM Cortex-A9 SoC, a gigabyte of RAM and 8GB of flash storage which is expandable via microSD card slot. There’s also 802.11 b/g/n Wi-Fi, Bluetooth 2.1, a front-facing VGA-quality camera and a rear 3-megapixel shooter. The system’s stereo speakers should give a bit of a boost thanks to Beats Audio processing. The slate itself measures roughly 10.7mm thick and weighs just less than a full pound. The Slate 7 will ship standard with Android 4.1 Jelly Bean. HP’s offering is $30 cheaper than the Nexus 7 and includes an additional camera and microSD card slot but it does fall short in some other key categories. Google’s tablet includes a beefier quad-core Tegra 3 processor, NFC, GPS and extra motion sensors. The Nexus 7 is also a tiny bit lighter and thinner and ships with double the amount of on-board storage. Ultimately it will be up to the buyer to decide if those additional features are worth the extra cash. HP’s Slate 7 is expected to launch in April but if you can’t wait until then, odds are we will see it sometime this week at Mobile World Congress.